Training for Business, Government and Education using Applied Improv; Equity & Inclusion, Communication Skills, Leadership, Team Building, Design Thinking, Presentation Skills, Story Telling for Business and breaking down barriers. CSz Business Training. Work is not just the numbers - it's the story. As CSz performers, we use our improvisation skills onstage to get people laughing. Conveniently, offstage, we use them to run a successful business. We specialize in teaching people HOW to use improvisation techniques in their work lives. We teach the essential, yet often overlooked or discarded, communication and listening skills that will consistently improve the quality of your work, home and social relationships. We call this Applied Improvisation. Worldwide, CSz has delivered successful training to employees in every known industry, from network execs to nuns, from lawyers to lumberjacks to high-tech engineers. We’ve been hired by at least 65 of this year's Fortune 500 companies, often repeatedly. In Portland alone, we've worked with over 500 organizations since 1993. We offer vital information in a format that's thoroughly entertaining and makes the discussion of key concepts both more resonant and memorable for your people. And that's the goal - give them a great experience that will bond them socially and empower them in their work capacity. One more thing: We never forget the fun! CSz Business Training can design a session or series that fits your needs and goals. Let us know what your needs are, and we'll design for your goals. Improvisation is not "winging it". It's a highly-refined system of observing, connecting and responding. Patrick Short on our improv system - watch the video here. These workshops are often the starting point for our clients. You've been hearing and reading that improv skills can help in a variety of business areas, including team dynamics and communication. We get your team moving, laughing, learning, and seeing each other as people, not positions. We've sourced a great group of exercises over the last 30+ years; we plan a syllabus and then adapt to your group in the moment - putting our own concepts into practice. No one is forced to perform, and each group brings its own special characteristics to the action. It's fast-paced and connects to your work. It's also inclusive, low-risk and amazing. Most Basics of Improv Skills for Business workshops are 2-3 hours, and fit well into a single day or multiple day event for your department or group. Often, they are used as a starting point to explore Leadership, Customer Service and other areas. "Everyone had a blast and it was so refreshing to have everyone smiling and laughing together. We had some incredible feedback from the staff and all of it was extremely positive. Some of them really feel renewed in their work and how they interact with others." What if your employees were empowered to make customer service an opportunity instead of a cost? The top of your game is not your rulebook, nor your script, nor what you did with the last customer. It's improvisation - a highly refined system of observing, connecting and responding. And while we help your people become more effective, we're bonding them together, engaging them and helping you retain them. Yes And Your Customer Service (Foundational Module) covers the basics of how using an improv mindset makes customer service more effective. Aim to Impress Customer Service (Tailored Module) goes deeper, exploring how awareness of Status and the Big Picture affect our ability to exceed expectations and make customers fans for life. Workshops range from two hours to multiple days to a series over several weeks. Let us know what you need. We'd love to help you get your service to the next level. "We built great awareness on considering the language we use and the actions we take and how they impact others. Improvisation is valuable, not just because it applies, but because it is a different way of tackling problems and opportunities. It brings new perspective in a fun, interesting and lasting way." Our lives are moving so fast that it's difficult to forge two-way communication; we often rely on e-mail and text, where over 90% of the context and supporting information is lost. CSz training helps your team recognize and grow their connections with each other. The Foundational Module includes listening, connecting, responding and meeting dynamics. The Tailored Modules involve deeper dives into team dynamics and are custom-designed to fit your industry, your group's identity and what your group does. "Very positive training, best one in years! CSz was AWESOME!" This is who we are, and we can do better. We use improv skills to illustrate and learn the differences between destroyer, equalizer and creator views of diversity. Accept - Adapt - Integrate. Doing better is a process, not an end-point. 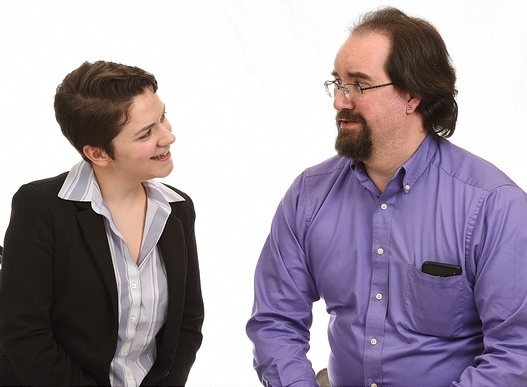 CSz Portland’s Equity and Inclusion Program is developed by Leann Johnson and Patrick Short. We are seeking more clients to help us continue this development. Call Patrick at 503.236.8888 x4 to discuss your needs. When people see a ComedySportz® show for the first time, they're often struck by how the players seem to read each others' minds, and how completely they support each other. No one seems worried when things go wrong - often, the audience can't even tell that something isn't perfect. It's not an accident. It's by design, and we can apply those same skills to your company. Give us a few hours of your people's time, and we'll help you build a stronger team. Sounds like a pretty good team, doesn't it? All of our workshops contain multiple elements of team building - and they go way beyond "trust exercises". Trust doesn't happen just because you catch someone falling backward. We give you the building blocks that create trust. Team Building is the core of what we do. Workshops range from two hours to multiple days to a series over several weeks. Let us know what you need. We'd love to help you build your team. "Wonderful! We really appreciate your efforts. The event helped solidify and create a great atmosphere within the team." Management is never easy, but it can become easier to lead. Great management takes ongoing work to overcome innumerable challenges. Hone the craft of caring for your team through listening, inclusion, support, empowerment and understanding the needs of those who follow. Have you noticed how the world has changed? Top-down hierarchies need to adapt to more flexible ways of thinking and doing. Inspire your leaders. Inspire your teams. We can help. "Since our workshop, my supervisors have been more effective in their communication and recognition of 'their customers', the front line employees. I personally enjoyed the fact that your group is professional, non-judgmental, encouraging and fun." Get rid of the roadblocks at the start of your projects. Improv culture - the spirit of collaboration through Yes, And... - is a great fit for Design Thinking. We've built an exciting Design Thinking module that fits right into a half day session of Applied Improvisation. "Thanks again for a great class today at PSU. Students loved it! One student from the architecture department even commented that what he learned from that session will probably serve him for life. Great thing to hear!" Improvisation teaches us a lot about life. Patrick Short is in his 31st year leading ComedySportz® Shows and Applied Improv Workshops; he also spent a lot of time in the high-tech industry, marketing to and selling to companies of all kinds. He gets how to relate improv concepts to actually doing business. We have other great presenters, too! It's a highly refined system of observing, connecting and responding. The results are pretty positive: we make something out of nothing, and make something better out of the opportunities we are given. Let us share this system with your group, department, team, meeting, association or convention. We can relate it to what they need. Guaranteed. When would you want a Keynote? We can tailor the presentation to your group and to your situation, from a few folks in a conference room to thousands. From 15 to 90 minutes, this speech will leave people laughing with each other. Even if what we say isn't laugh out loud, the exercises we weave in for demonstration and participation will be a blast. Looking for a motivational speaker who can give your audience practice and experience to make a positive change in the world? Give us a call. 503.236.8888 x4. We're comfortable in front of audiences without a script. We can teach you how to be both comfortable and effective. An introductory training course for novices. Coaching for more experienced students. Sessions can be customized to focus on the student’s specific needs and can be done in-house or remotely. Our teachers have hundreds or even thousands of ComedySportz® shows and workshops under their belts. Through our licensing organization, the CSz Worldwide, we've exchanged ideas and training with the best improvisers and teachers across the United States and United Kingdom, and certified this through our Certified Applied Improvisation Provider program. Now, by adding membership in the Applied Improvisation Network, we've gotten even stronger through world-wide alliances. We're constantly improving our offerings, and we work with amazing companies. We also have the business experience to back our activities up, make sense of them and relate them to your objectives. Our Co-Owner and General Manager, Patrick Short, a veteran of CSz since 1987, was involved in our very first team building engagement with Apple in 1989. Patrick began using Applied Improvisation during graduate school, teaching elementary education candidates at the University of Wisconsin how to survive in the classroom. After receiving the MFA degree in Directing, Patrick moved into hi-tech marketing and then sales, assisting clients with their acquisition of manufacturing and distribution systems; this career allowed him the opportunity to learn how companies work - and sometimes don't work. He's taught our CSz 101 Class, a beginning improv course, 99 times - and has designed and led custom workshops for over 600 organizations. Patrick wrote the Corporate Workshops portion of our league-wide ComedySportz® Manual and has co-authored two books. Meet Patrick through this video. CSz Portland has 45 team members; all came up through our classes and Minor League System. We've never had an audition. Most players attend between 25 and 100 workshops a year. That's a lot of continuing education. 25 members of the team teach during the year. We've performed over 5000 shows and taught more than 2000 workshops since 1993 - in a business with an average lifespan of six months. We operate a profitable for-profit company - most theatres are not-for-profit and most teachers in our business are sole proprietors; we're putting our own training into practice - in our own company - every day. Our whole team has soaked up approaches from a wide range of sources in Applied Improvisation and beyond; We've synthesized our methodology by serving hundreds of clients in many fields and by teaching each other within our group. We bring the appropriate people to work with your group, and we have resources to draw upon both inside and outside our organization (nationwide and world wide). 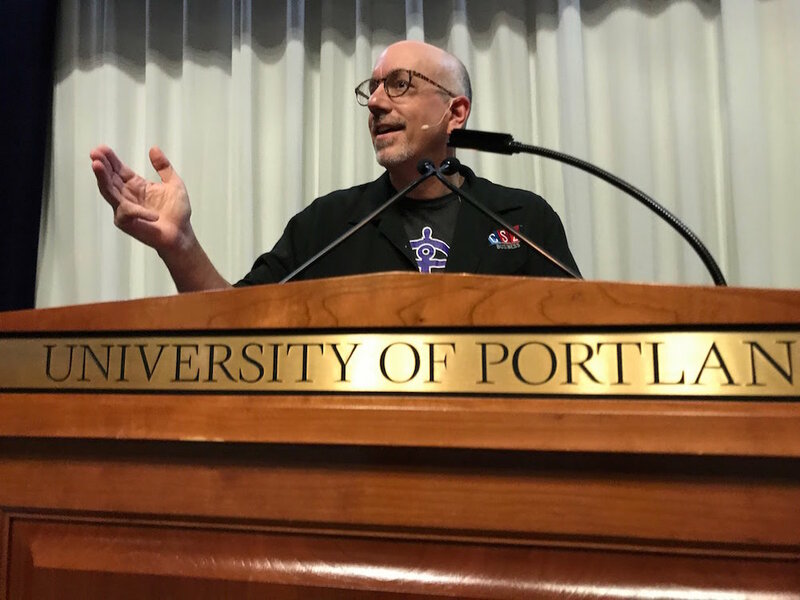 CSz Portland's Patrick Short has teamed up with Jill Bernard (HUGE Theater and CSz Twin Cities) to author a book that crystallizes what we've learned about improvisation applied to business. It's called Jill and Patrick's Small Book of Improv for Business. In a quick 108 pages, you can connect the dots between improv (the system and techniques we use to create our amazingly fast and funny comedy shows) and business (what you do, what we do, what everybody does offstage). Improv is not just folks talking off the tops of their heads; it's a system of observing, connecting and responding, and applied to businesses, it can make a real difference in productivity, innovation, creativity, support and fun. "The power of Jill and Patrick's message is that it works. I have seen their "play" reach hundreds of lives. There's a whole lot more possible when we lower our barriers and let the truth of what's in this book sink deep. They not only entertain audiences with improv, they live it. They work it. They teach it. They make us "corporate types" better because of it." Jill & Patrick's Small Book of Improv for Business gives you the straight info and about 20 exercises for individuals and groups; it's meant to be quick and insightful - without a lot of padding to make it look more important. Available at the CSz Portland Arena during show hours. Improvisation gives you tools so that you can work quickly and creatively in an ever changing world. This book teaches you not only the value of improvisation, but also how to put that value into practice. From an explanation of what improvisation is, to leading improvisation, to improvisation in multi-cultural teams. Whether you're a manager who wants to use the power of improvisation, or a trainer who wants to teach it to other people, this book will give you the theory and the tools to do just that. This Special Edition includes an additional chapter on Customer Service, written by Patrick Short. Foundational modules are workshops where your needs and goals are fairly straightforward, and the amount of pre-workshop prep for our team is minimal. These are workshops we've taught before; we've perfected the syllabi and are comfortable making changes during the workshop to fit the group's needs. Foundational modules are almost always a half-day or less, and the groups generally don't exceed 40-45 people, depending on the content (usually, they are less than 25 people). There are standard fees for Foundational Modules, and the only other charges are travel and for a second presenter if needed. We charge by the half day, and are happy to quote by phone once we connect on your needs and goals. In these cases, we prep more and we charge more. It's not exponential, and we will quote by phone so you know the scope. To discuss pricing and options, please contact Patrick Short at 503.236.8888 x4 or patrick (at) cszportland.com.